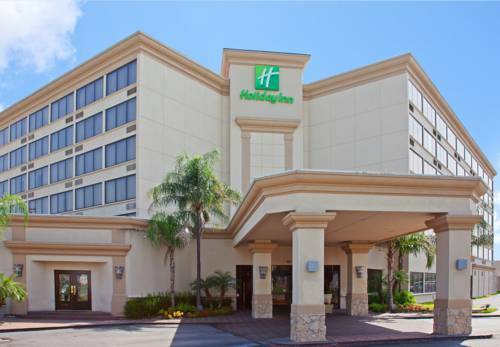 Convenience Pervades This Houston Hotel's LocationThe Holiday Inn Houston - Hobby Airport hotel's address in Houston, Texas helps travelers stay on budget while keeping them close to downtown and Houston Hobby Airport (HOU). Since the hotel is near Houston Hobby Airport, corporate travelers won't need to rent a car and fight hours of traffic to get to their flight. Our complimentary shuttle service makes stops at the airport and other destinations within a two-mile radius of the hotel. We're also conveniently located near FlightSafety, Million Air, Jet Aviation, Atlantic Aviation, Wilson Air, Lamons Gasket, Powell and Signature. You can also stay productive with free wireless Internet access and a 24-hour Business Center with free local fax, print and copy services. Lucky for the hotel's leisure guests, Houston, Texas has no shortage of attractions. From the sights, sounds and smells of the exciting downtown to NASA's Johnson Space Center to great shopping at the Galleria, there truly is something for everyone. Just make sure to budget your time! While our hotel near Houston Hobby Airport boasts a fantastic location, we also provide an array of perks to meet your needs. The outdoor pool, hot tub and the Fitness Center are open until 10pm, so you can unwind on your time. We also offer the free shuttle service 24-hours a day. We will do our best to accommodate any requests and look forward to making you feel at home during your stay. Book your room today! Boulevard Lounge is open between 5:00PM and 11:00PM. Dinner is served from 5:00PM to 10:00PM. 1900 Square Feet of Contiguous Meeting Space. Built in 84 x 84 Screen. Wireless internet capability and complimentary. Meeting Room will seat 80 people Classroom Style. Room has airwalls and can be separated into 3 separate meeting rooms for breakouts. Bouelvard Boardroom is 336 Square Feet. Complimentary Wireless Internet available. Screen and Phone can be added to room. Room is secluded from Main meeting areas and works great for testing, board meeting, or deposition room. The Hughes Room is 728 Square Feet. Complimentary Wireless Internet available. 84 x 84 Screen built in. Phone can be added to room. Room located in the Main meeting areas across from Cafe. 9' Ceilings. The Wright Brothers Room is 650 Square Feet. Complimentary Wireless Internet available. Screen and Phone can be added to room. Room located in the Main meeting areas across from Cafe. 9' Ceilings. The Earhart Room is 572 Square Feet. Complimentary Wireless Internet available. Screen and Phone can be added to room. Room located in the Main meeting areas across from Cafe. 9' Ceilings. Children's program - Houston's Children Museum. Voted #1 children's museum in the United States. Phone: 713 522-1138. Website: www.cmhouston.org. Located at 1500 Binz Street, Houston, TX, only 12 miles from the hotel. Upscale fashion mall featuring brands with over 160 shops such as Dillard's, JCPenney, Macy's, Sears, Aeropostale, and franchise restaurants. Over 50 upscale high fashion stores and eateries in Houston's most visited shopping complex. Includes top boutiques. Ice skating rink, movie theater and more. Wildcat Golf Club offers a variety of recreational activities for members and guests. Enjoy sweeping views of the Downtown Skyline on the Diving Bell Ferris Wheel, Aquatic Carousel. Cool off in the Dancing Fountains, or a thrilling Ride on the Lighthouse Dive. The Aquarium Restaurant offers guests an exciting upscale dining experience. Dining Options include Landry's Seafood, Saltgrass Steak House, The Aquarium, Red Sushi Habachi Grill, and other first class restaurants. Amusements include a Double Decker Carousel, Dancing Fountains, Balloon Wheel, and Boardwald Bullet Coaster. Houston's Premier Sports Venue. Home of the Houston Livestock Show and Rodeo and the Houston Texans Football Team. Also home of the "Astrodome" the worlds first domed stadium. Playground for your mind. 90,000 square feet of interactive exhibits. Voted #1 Children's Museum in the United States. Take a break and enjoy the Houston Zoo, one of Parents Magazine's Top Ten Zoo's for Kids. Bring the whole family. Houston's premier Waterpark. Located in North Houston, call the park directly for details. Dedicated to educating people about the Holocaust, remembering those who died and hornoring the survivors legacy. Houston's only interactive health science center. Tour a larger than life Human Body and explore your mental, physical, and future selves. Free Thursdays, from 2pm - 5pm. Experience the wonders of science up close from ancient dinosaurs to stunning gems. Join them for lectures, tours, and special exhibits! Truly spectacular! Free Tuesday after 2pm. 32 aquatic adventures during the Summer Season. Open April through September. Discovery Green is a public park in Downtown Houston. The park includes a lake, bandstands, and venues for public performances, two dog runs, a children's area and multiple recreational areas. Featuring waterfront fun and entertainment like no other Gulf Coast destination, the Galveston Island Historic Pleasure Pier features family-oriented attractions including rides, midway games, a wide selection of food venues and retail shops. A 14-foot-long, 22-foot-tall steel-plated dillo, with longhorns. Its eyes glow red, and smoke pours out its nostrils.